“Human reason cannot figure its way to such a God, since a God we could figure out, a God fitted to the categories of our understanding, would therefore not be transcendent in an appropriately radical sense. We can know the transcendent God not as an object within our intellectual grasp but only as a self-revealing subject, and even our knowledge of divine self-revelation must itself be God’s doing. Christian faith finds here confirmation of God’s Triune character: We come to know this gracious God not merely in revelation but in self-revelation in Jesus Christ, and we come to trust that we do know God in Christ throiugh the work of the Holy Spirit” (p. 182). Human reason can never bring us into knowledge of the transcendent God. If we could reason our way to God (despite the fact that our reasoning ability is completely corrupted by sin) then God would not be transcendent. He would not be wholly different. 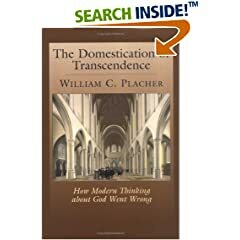 The Creator-creation distinction would be destroyed if we could reason our way to God. Instead, the transcendent God is revealed to us through divine revelation in the Scriptures. But, it is most clearly manifested in the person and work of the second person of the Triune God, Jesus Christ. But He is revealed to us through the work of the Spirit. So, we know of God the Father through the revelation of the Son through the work of the Spirit. We do not worship only one member of the Trinity, but we worship all members of the Trinity as they are all our Great God. Praise be to the great and almighty transcendent God! Please pray for me for some upcoming ministry opportunities. If you are in the area for any of my speaking engagements I hope to see you there! But if you are not, please pray! Check out my friend Stephen Yuille’s new blog, Deus Pro Nobis. Stephen is an elder at Braidwood Bible Chapel in Peterborough, ON and a professor at Toronto Baptist College and Seminary. He is also the author of the books, The Inner Sanctum of Puritan Piety: John Flavel’s Doctrine of Mysical Union with Christ, Puritan Spirituality: The Fear of God in the Affective Theology of George Swinnock, and Trading and Thriving in Godliness: The Piety of George Swinnock. You will most certainly enjoy everything you read here and will be edified. Check this blog frequently! You are currently browsing the Working out Salvation with Fear and Trembling blog archives for August, 2008.